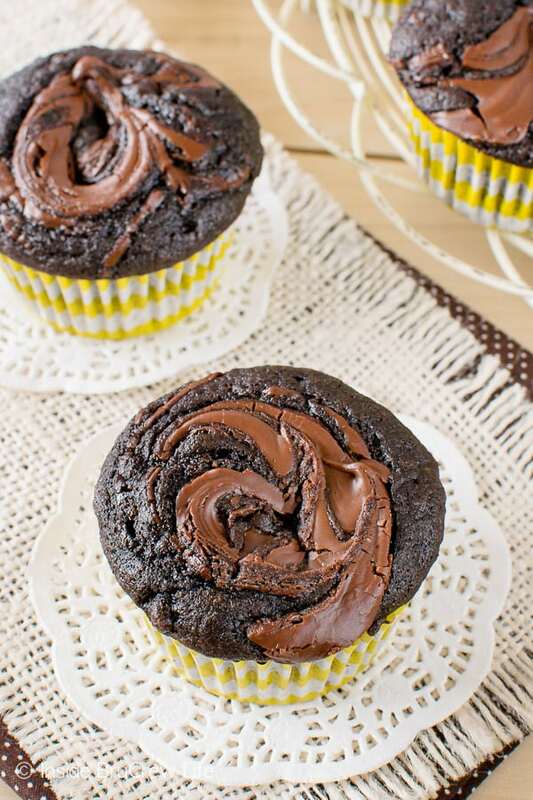 Sweet chocolate swirls add a fun touch to these Chocolate Nutella Banana Muffins. Great muffin to wake up to in the morning! After a few weeks away from my favorite baking ingredient, I had to buy a few bunches of bananas. Of course, I buy them green because I like to eat a few that way first. Then the rest sit on the counter until they are too black for anyone to even think about. Oh, but I’m thinking about those bananas. I’m thinking up fun new recipes for that delicious fruit. 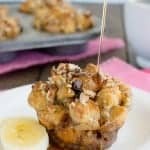 Since our kids love having muffins around for breakfast and snacks, I knew these bananas were destined for a breakfast muffin. 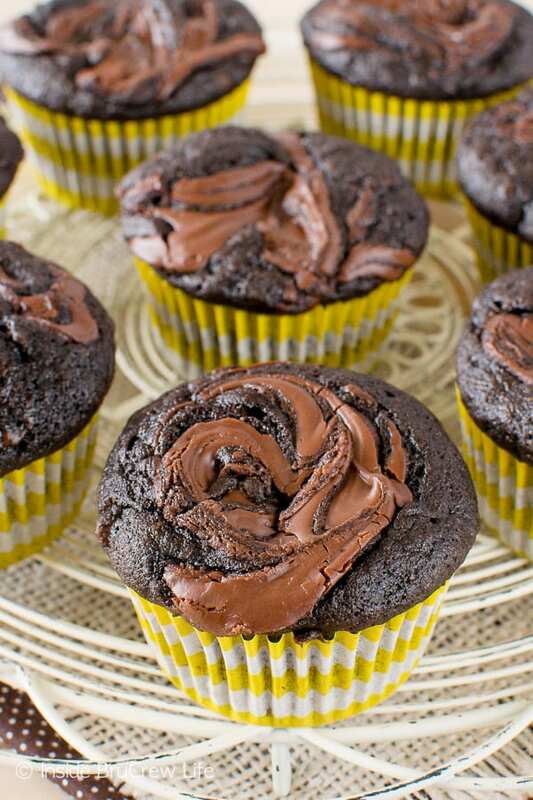 Of course, with all the chocolate in the recipe, you might want to call it a cupcake. Of course since it doesn’t have frosting, I call it a muffin. It’s how I feel better about eating one in the morning. 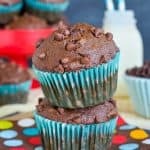 A few years ago I made these double chocolate banana muffins, and it has been our go to muffin recipe when those bananas get too ripe. 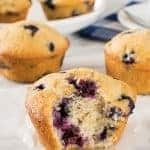 It’s not just our family that loves these muffins. 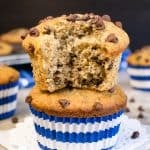 I have had quite a few comments and emails from readers who love these muffins too! They are a favorite with everyone! This past fall I updated the pictures for these pumpkin Nutella muffins because pictures from 4-5 years ago just don’t do things justice. Anyway, I haven’t been able to get that swirl out of my head since then. It got me thinking on whether or not I could include it in my favorite banana muffin. Yup, it works. And oh, boy, do they ever taste amazing! 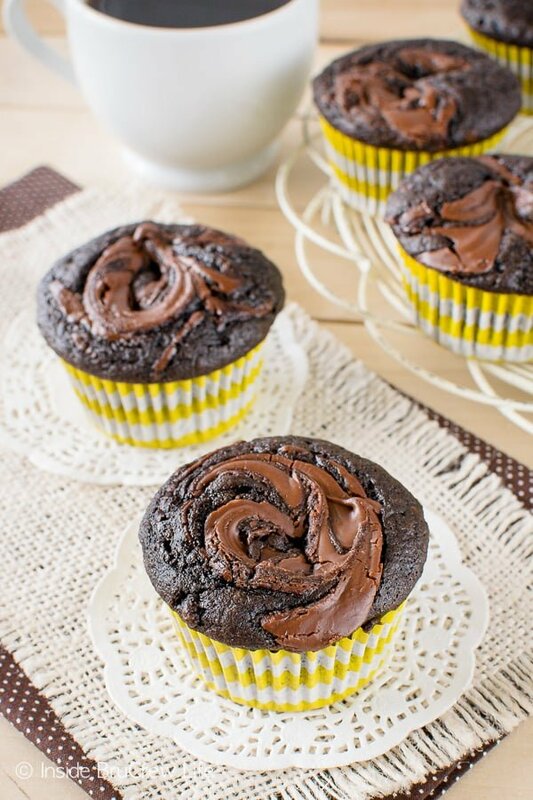 Trust me and eat one fresh from the oven with a hot cup of Nutella hot chocolate. 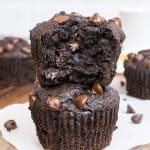 Well, maybe wait a minute or two because you don’t want to burn your tongue on the molten Nutella lava swirls in the muffins. My daughter is a fan of putting cookies and muffins in the microwave for about 5-10 seconds. She has a thing for warm gooey treats! 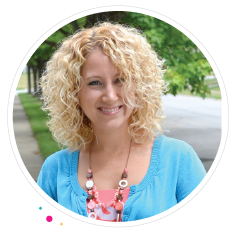 I have to admit, she is one smart cookie…or muffin depending on what I made that day. 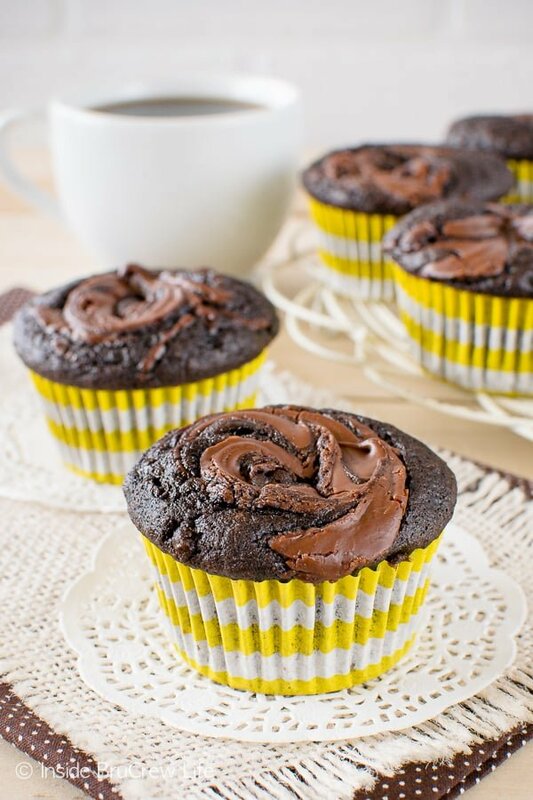 Run, don’t walk to the nearest grocery store and buy some bananas because you really do want these chocolate Nutella banana muffins in your life ASAP! Preheat the oven to 350 degrees. Place 16 liners in a cupcake pan. Beat the sugars, egg, and oil until creamy. Add the banana and beat again. Mix together the flour, cocoa powder, baking powder, baking soda, and salt. Slowly add to the banana mixture until mixed in. Spoon the mixture evenly into the prepared pan. Heat the Nutella in a microwave safe bowl for 15-30 seconds. Stir until slightly melted and creamy. Divide it evenly on top of the muffin batter. 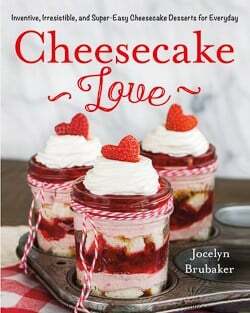 Use a toothpick to swirl it into the batter gently. Bake for 17-18 minutes, or until a toothpick inserted into the muffin portion comes out mostly clean, (Do not stick the toothpick into the molten Nutella.) Remove the pan from the oven and let the muffins cool for 2 minutes before removing them and placing them on a wire rack to cool completely. Store in a tightly sealed container. It looks so easy! But I have try 2 times to get the perfect muffin. It’s so yummy too. Love you, Jocelyn and thanks! I can’t wait to read more! Nom nom. 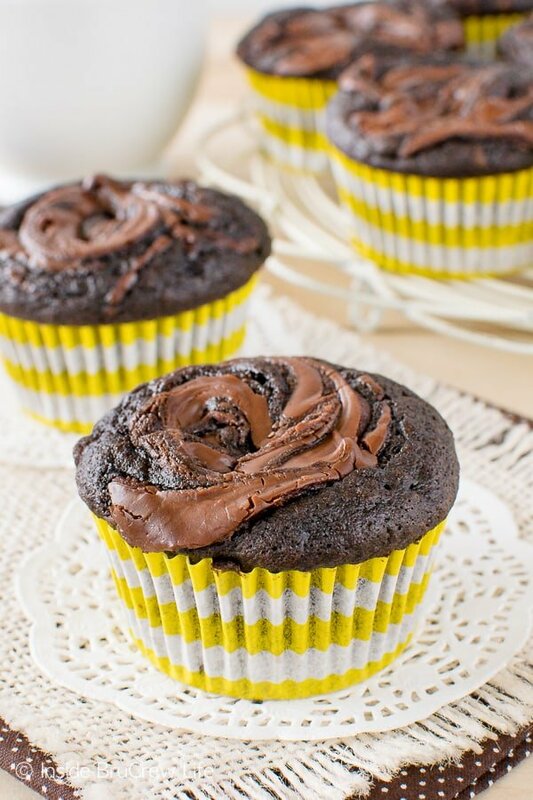 Banana Nutella with chocolate. My favourite dessert:x.
I honestly do not know. I only share recipes that my family eats, and we do sugar. I’m sorry I couldn’t help more. 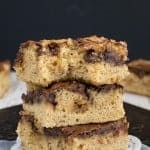 If you try them with Splenda, let me know how they turn out. Hi,can i use unsweetened cocoa instead? Do you mean in place of the dark cocoa powder? Yes, that would be totally fine. The color just won’t be quite as dark. I hope you enjoy the muffins.